Indomitable was steaming at 22knots in fine weather. The sunlight was strong, the sea calm, and there was virtually no wind or cloud. The damage reports came thick and fast. There was a major fire in the forward torpedo room, close to “A” Group 4.5in turrets. The Main Naval store between 121 and 127 stations was flooded, as was the main deck above. This induced an 8 degree list to port. The first order appears to have been something of an ill-considered panic response: The Captain reported to the Damage Control Headquarters that “A” turrets were on fire and ordered “A” magazines to be flooded. Damage control responded immediately: All the “forward group” magazines were flooded, including pom pom, fireworks, torpedo warhead and small arms spaces. A review panel later deemed this to have been unnecessary. The magazines, being deep within the ship, were some considerable distance from the turrets themselves. The Captain's next command was to counteract the list. Flooding of counter-balance compartments began and the carrier returned to an even keel within 30 minutes of the attack. The raid had reached its peak when, suddenly, a squadron of 12 Stukas appeared, high in the sky over Indomitabe. Fighters were after them, and a hurricane of flak went up from all sides, as one after another they peeled off at 12,000ft and dived on the ship. The 1000-pounders rained down in a concentrated onslaught, and in a moment she had vanished behind a dense geyser of spray. Two, three, were hit and plunged across the sky into the sea; but Indomitable was hit too. Smoke and steam billowed up above the wall of water; and for a quarter of a minute it seemed as if she could never re-appear except as a smoking hulk. Then, slowly, as the mass of water heaved up by the near-misses subsided, she emerged, listing, on fire fore and aft, nearly stopped, but still afloat. From every ship men watched her anxiously; isolated from the disaster, yet sharing in it, impotent to hep yet suffering the wound as if it were to their own ship and their friends. For twenty minutes she dragged in a slow circle, her deck heeling and the smoke pouring from her. Then she began to right, and the smoke that seemed to issue from the lifts lost its density and thinned into a wisp; a signal lamp blinked: “SITUATION IN HAND”, and she steadied on course. Dense smoke rapidly began to spread through the ship. In particular the Central Communications Office and Switchboard Flat were filled with acrid fumes drawn through the ventilation shafts from fires started in the Boys’ Mess from Near Miss 1. This could have eventuated in a serious communication break-down during the damage control operation. However, ventilation valves were shut and ducts diverted, limiting the penetration of the smoke. Electric phone communications remained operational throughout the crisis and enabled fast reporting and relay of orders. The lower hangar reported no damage from the adjacent impacts. However, the situation in the main – upper – hangar was much more confused. The hangar sprayers were activated as a precaution, with water pooling up to 6 inches on the port side due to the carrier’s list. The drains worked effectively. The hangar’s forward asbestos fire curtain lowered normally, but the aft curtain proved to have been jammed by distortion from the blasts. It was soon determined that a large oil drip tray had caught alight in the forward deck, as had a fuel hose in the aft hangar space. Both were quickly extinguished by foam hoses and the armoured doors to the lifts rolled shut. A fire in the Film Store was next to be tackled. 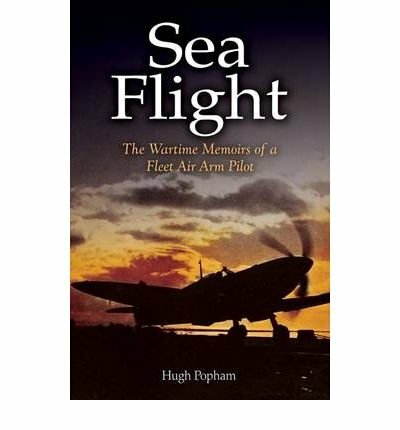 The aircraft petrol systems were drained and flammable materials stowed. Most of the smoke entering the hangar had come from the forward lift well, part of which had been blown inward from the bomb blast and subsequent ammunition explosions. Hangar damage control teams and four hoses were quickly redeployed to help with the fires in the forward Torpedo Body Room and the Petty Officer’s Mess beneath it. FAA ratings were deployed to the hangar to take their places. The fire in the torpedo room was to prove something of a concern. The calcium store had caught fire and its intense flames would only eventually be contained through heavy use of chemical foam and sand. Such was the intensity of the blaze and that fears were held for the integrity of “A2” 4.5in mount's Ready Use Locker. 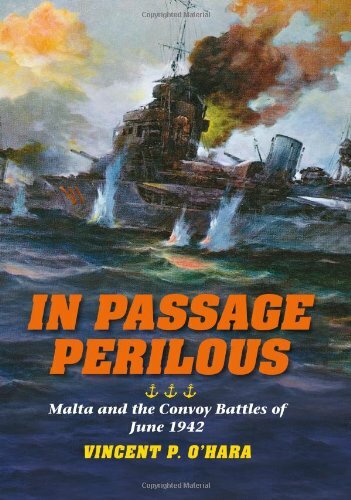 The Captain ordered the starboard side wireless masts be urgently raised in order to allow a destroyer to come alongside and play its own fire hoses through the gaping wound in Indomitable’s side. Damage control teams took 45 minutes to control the blaze. Despite the thirty-foot hole ripped out her hull below the waterline which had been discovered in dock, Indomitable was still capable of twenty-six knots… The after lift was still working, and such Fulmars and Albacores as were still on board were ranged. The carpenters set to and built a ramp up to the rostrum of the for’ard lift. And as we steamed up the Irish Channel the aircraft were flown off. In the lower aft decks of the ship the crew raced to prevent the flooding from Near Miss 2 spreading. Watertight doors from the Nos 5 and 6 Naval Stores – initially thought to have been left open but subsequently found to have been blasted upward – were closed. The Lower Deck’s Armaments and Decontamination stores were also flooded. Flooding in the Main Naval Store on the Main Deck beneath was controlled. In the Hold, the deepest section of the ship, the Port Gland space, Plumber’s Block and Small Arms magazine were also subject to rapid flooding. Adjacent compartments on all three decks were tested for air pressure before crews entered to plug and shore the bulkheads. The fires raging above them made the task even more daunting. Seventeen fire hoses had been strung through the ship to douse the flames extending over three decks in the stern – not counting those run along the Flight Deck to play upon the thick black smoke billowing from the gaping wound in the deck. 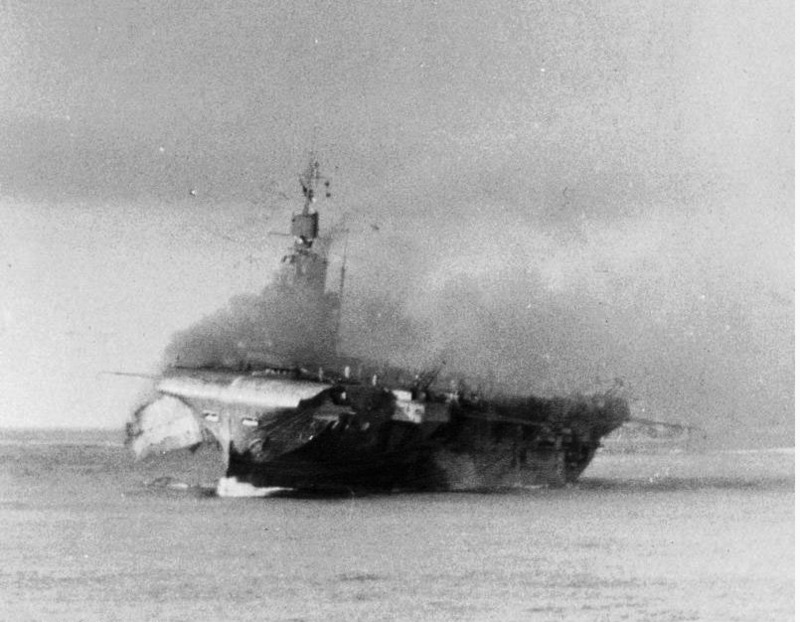 With the fires under control and the Indomitable’s list corrected, the full extent of the carrier’s damage became apparent. The 14in penetration hole near Indomitable's forward lift. Forward Lift: The forward lift was badly buckled by compression from the adjacent bomb hit. The blast had lifted the platform upward, but the sprocket chains had held – albeit badly stretched and distorted. Initially the 9ft starboard buckle would have prevented aircraft operations. But later efforts by damage control teams to correct the distortion with block-and-tackle flattened it to a 2ft centreline “arch” so as aircraft – without a torpedo – would be able to fly off. Motors, transmission gear and electrical equipment on the starboard side of the lift well had been destroyed by the bomb. Those on the port side were largely intact. Nevertheless, the lift remained jammed in the up position. Aft Lift: The deep damage from Near Miss No2 and the bomb on the aft flight deck had slightly distorted the aft lift’s mechanisms. The platform itself had sagged several inches on the middle line. Damage Control quickly set to work in fairing off the 6in depression and disengaging the jammed port transmission. The lift was soon returned to operation at half-speed by means of the starboard motors and transmission. CLICK on the above image for a larger view.Top left and centre, views of the blasted hull just forward and below of "A" Group 4.5in gun mounts. Bottom left, the buckled forward lift - forced upwards by the blast of the 550lb SC bomb. The first bomb strike penetrated the strengthened steel of the Flight Deck alongside the forward lift, passing through the 10lbs of the Upper Gallery deck before detonating some 16ft after its first impact point – just above the Upper Hangar Deck. It was pointed out the 14-in hole reported in the 60lb steel plate alongside the forward lift was too small for a 1100lb (500kg) SD-style bomb. Intelligence recorded the diameter of this weapon was 18in, with an older style being 15.5in. Only the 550lb (250kg) SD bomb had a 14in diameter. One report argues that the blast damage in the forward hit was most consistent with that of an SC-style ‘burster’ bomb. Several large shell fragments were eventually recovered which supported the argument that the bomb had been a 550lb (250kg) SC type. A large flap of hull plating dangles out from the starboard forward section of Indomitable, blasted outward by the 550lb GP bomb and subsequent detonation of the 4.5in shells in "A1" Ready Use locker.. The first bomb struck near the forward lift, 6ft to starboard of its forward edge, at 30 station. This section of the flight deck was unarmoured, though it was strengthened 1.5in steel. The bomb punched a 14in hole in the Flight Deck and passed the Upper Gallery Deck to burst just above the Upper Hangar Deck level. It blasted a hole of up to 30ft in diameter between the three decks and peppered the nearby structure with splinters. The forward lift was also affected: The blast bent its starboard side upwards considerably. The adjacent accelerator was also buckled and the forward wind barriers warped out of their recesses. The Flight Deck itself was lifted by up to 2ft from 22station through to 34 station. The bomb detonation ignited a serious fire which spread to petrol lines and the No1 Torpedo Body Room. The seat of the fire was below and slightly forward of A1 Turret. Some 15 minutes after the bomb struck, the A1 4.5in Ready-Use Locker exploded – most likely due to heat igniting cordite charges. This is believed to have burnt a hole in the deck, allowing the shells to roll into the fires below where they eventually burst. This added considerably to the casualties and damage forward. The explosions had ripped a large hole in Indomitable’s side, pushing out a sizeable portion of plating between 21 and 30 stations to dangle above the water. The lower gallery, main gallery and hangar deck spaces were opened to the elements. As the fire raged, damage control teams ensured “A2” Ready-Use 4.5in Locker remained sealed and safe from the flames. Both turrets, along with “B” Director, were destroyed and more than 20 of the Royal Marine gun crew killed. CLICK on the above image for a larger view.Top and centre left pictures show the gutted section of aft fight deck. Bottom left is a view of the wrecked interior. This bomb penetrated the 14lb steel of the aft Flight Deck as well as the 10lbs Upper Gallery Deck, detonating just above the Upper Hangar Deck. It also had travelled 16ft from the point of first impact. No trace could be found of the initial penetration hole from which the bomb diameter could be established. The section of deck plating had been blasted up and folded over the port side of the ship - bulkhead walls sticking upwards like fins. This large section of steel was rapidly cut from the deck and tipped over the side by damage control teams - taking with it the evidence that would have been provided by the bomb entry hole. However, the bomb analysis team argued that the extent of this damage indicated a “burster” type high-explosive SC weapon, and not a SAP bomb. It ruled the weapon to have been 250kg (550lb). 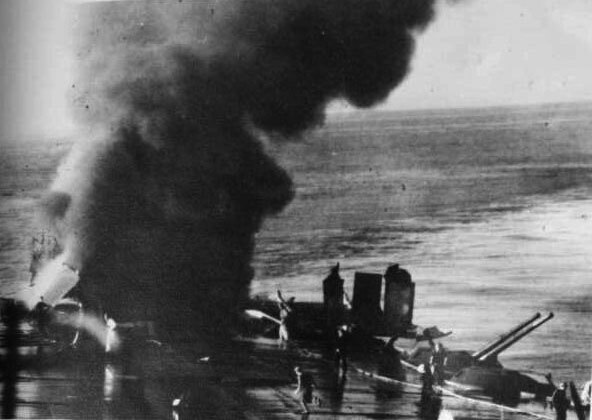 The second bomb struck the Flight Deck close to the centreline at 164 station, between the aft lift and the round-down. Its detonation had a dramatic effect on the Flight Deck. The light 14lb plates were ripped open over a 56ft by 40ft area. The starboard side had been lifted upward. 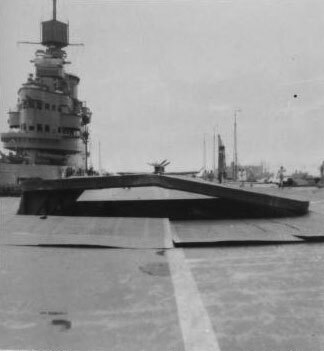 The port side of the blast had folded over a large section of the Flight Deck and Gallery-Deck bulkheads. These had to be burned away and pushed over the side to allow aircraft to carefully touch-down further forward on the flight-deck. The rear lift remained operational, though only at half speed. As with HMS Formidable, the design requirement that the lifts remain operational despite misalignment proved worthwhile. The bomb passed through the Upper Gallery Deck, detonating just above the Upper-Hangar Deck in cabins alongside No2 Torpedo Body Room. The nearby warheads were successfully protected from the blast and fire by their armoured mantlets. But the fires and debris caused extensive damage to the Torpedo Body Room and surrounding cabins. A Fabric Store in the Upper Gallery Deck was also set ablaze. The blast ripped a hole 16ft wide in the aft Hangar Deck (not part of the actual hangar itself, though). CLICK on the above image for a larger view. Pictures show the peppered port hull plates from inside the wardroom and outside the ship. Another bomb clipped the side of one of the port pom-pom directors at 63 station. This bomb’s detonator was triggered after it clipped the lower edge of the port pom-pom director sponson, leaving a groove in the bulkhead . It travelled a further 16 feet before exploding in the air some 5ft from the ship’s side. 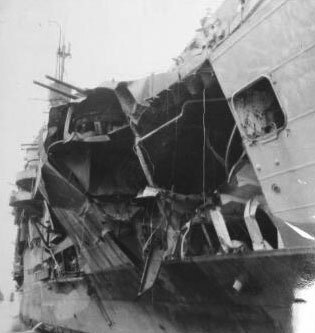 While the blast from the air-burst shredded the 17 and 14lbs side plating between 59 and 63 port stations, it also sent shrapnel deep into the ship. The bomb destroying a large section of the hull plating covering the Boys Mess and the Wardroom. Indomitable’s Wardroom had been filled with off-duty pilots and observers from 827 Squadron’s Albacores. The detonation sent splinters ripping through the space, killing and wounding everybody within it. A small fire was reported in the Boy’s Mess above, but this was quickly controlled. It was a similar situation in the lower, body-strewn Wardroom. The blast and fragments had killed many, but fire had not established a firm hold by the time damage control parties arrived. Splinters were found up to 52ft inside – some 57ft from the point of detonation after passing through the 17lbs of the ship’s side and 10lbs of the Wardroom bulkhead. About 52ft of Wardroom’s internal bulkhead was torn from its welded heel to the deck, forcing it into the adjoining central corridor. The damage from the blast was judged have been caused by another 250kg (550lb) SC warhead. CLICK on the above image for a larger view. Pictures show the damaged port hull plates from below the waterline after a 1100lbs "near miss". Extrapolating the true nature of this bomb proved to be the most contentious. Witnesses reported seeing a “large” bomb strike the water some 25ft from the port-aft quarter of Indomitable off the stern quarter at 125 station. Bomb analysts later determined it must have exploded at a depth of 25ft. The detonation was alongside the aft lower-corner of the side armour which was unaffected. However, the concussion blew in the side of the carrier over an area of 48ft by 20ft. The ship’s 20, 25 and 30lbs shell plating was blown inwards from the Lower Deck to the bottom of the shaft passage. The she ship’s side was peeled open between 121 and 133 bulkheads, with dishing in frames before and aft this space. All wing compartments between 113 and 139 stations were flooded – to a length of 104ft. Indomitable rapidly took on some 760 tons of water to induce an eight degree list. DUBD asserted a 1100lbs (500kg) SAP bomb would not be capable of causing that level of damage at that distance. The thickness of the bomb’s wall to allow armour penetration and “shaped” nature of the charge being highlighted as reducing the “near miss” effectiveness of the 320lbs of TNT within. Rather, DUBD argued the bomb would have had to be something in the order of a 2200lbs (1000kg) HC or GP bomb to produce the necessary blast effect from that distance. The naval office disputed this: Its calculations showed a 1100lbs (500kg) HC or GP bomb could produce enough compression at 25ft to inflict the damage experienced. A fragment of the bomb recovered from Indomitable’s No2 Naval Store bore the naval office out. The 6mm thickness of the bomb’s walls were consistent with both 550lbs (250kg) and 1100lbs (500kg) SC bombs. The conclusion was that either a 550lbs (250kg) bomb had fallen closer than the stipulated 25ft, or that the bomb had indeed been a 1100lbs (500kg) bomb as originally reported. A third bomb of unknown size detonated in the sea off the aft port quarter, with the shockwave causing minor damage to the rudder. A dozen or so splinters also punched their way through the hull to the Captain’s apartments. 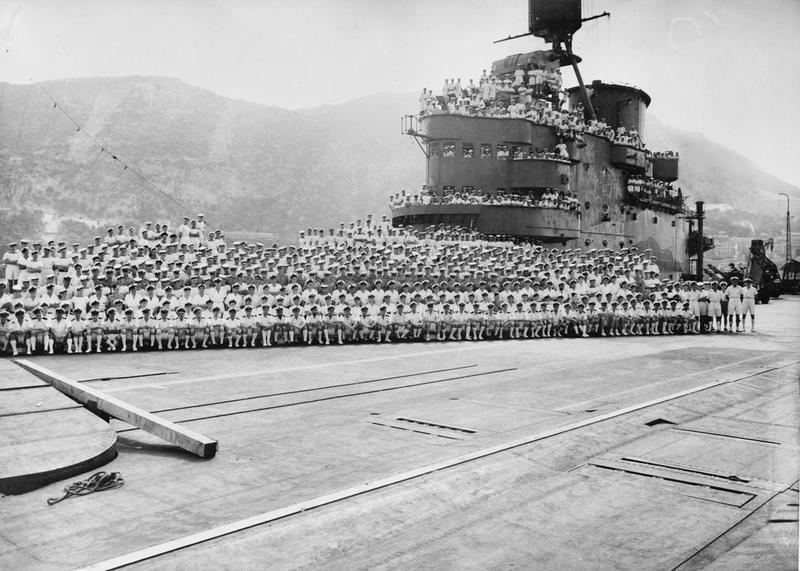 The ship's company of HMS INDOMITABLE pose for a photograph after escorting the Malta Pedestal convoy. The buckled forward lift can be seen in the left foreground.